This old outhouse, just off the main Little Sandy Creek Road at Rush Branch saw many a year with rain and snow. It was used for a number of things, such as counting waspers, hornets and yellow jackets, counting corn cobs, and reading pages from old magazines. Unlike an outhouse farther up the branch at what used to be the Pauley's place before the 2-story structure caught fire, this one never got pushed off into the branch with someone in it. And of course, that someone lived down here at the Strickland place, and was none other than Russel Strickland. Someone just thought it would be fun to push him off into the water; however, he cut his side and was lucky his injuries were not more serious. Can't remember who did the pushing, but it wasn't me. Well oh yeah, back to "this" outhouse story. Pig Strickland used to come down the holler and dig out the trench behind it now and again. What a guy! Family legend has it that Papaw Wes Strickland told his daughter's boy (his grandson), Mark Strickland, to shoot a black snake which had crawled into the outhouse and apparently seemed to love it. Although the snake probably thought of himself as one of the family, it seems the family had other ideas. Mark said, "Papaw, if I shoot it there, it's gonna mess up the seat." But Papaw said, "I don't care...shoot it!!! "...and shoot it he did. Evidence of the shooting were to be found for some time to come at the spot marked by the white line in this photo, taken before this wooden monument to mankind's genius was finally laid to rest. Rest In Peace ol' nasty. We remember you well. 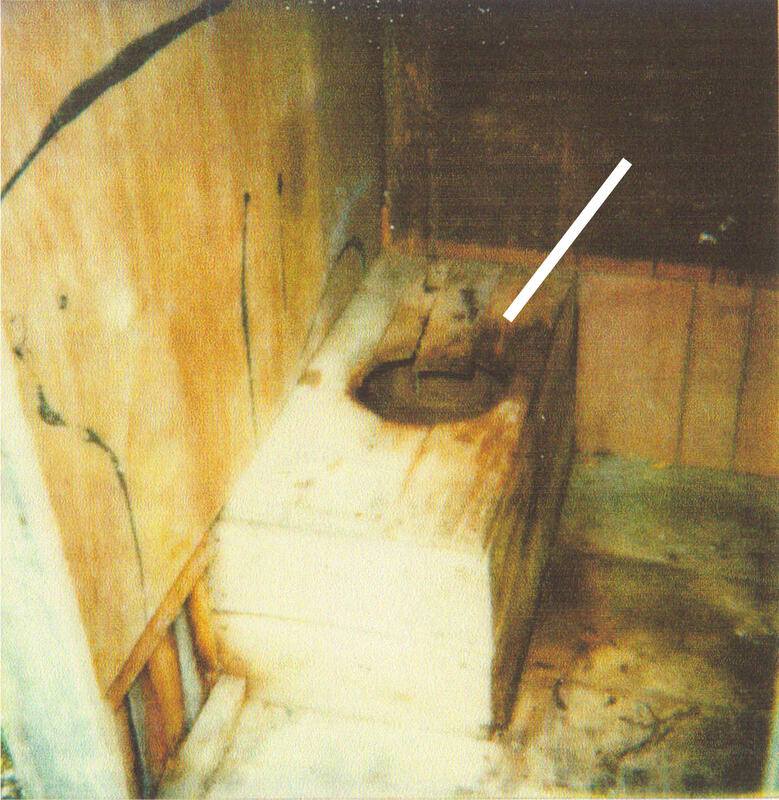 As to the transient who tried to squat on family land, right there in the outhouse, exactly where he was buried was never revealed...and we are left to guess about this part of the story.